The title pretty much says it all. In Mark Bittman's new diet/cookbook he promotes the idea of eating totally vegan food up until 6pm, and then eating whatever you want after 6pm. The idea is that 2 out of 3 of your meals will be vegan, a vast improvement in diet for most people, but you won't feel so deprived of the foods you love that you give up the entire endeavor for one chocolate chip cookie or chicken wing. 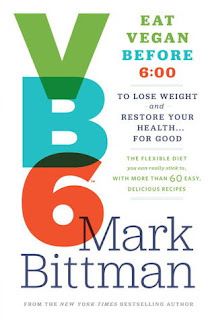 Bittman has been promoting the move to a plant-based diet for years, and after some health scares VB6 is what he has found works for him to balance his need to rein in his health problems while still eating adventurously and decadently. I picked this book up for the recipes (though I already own Bittman's comprehensive How to Cook Everything Vegetarian) and only ended up reading the rest of it out of curiosity. "Eat vegan before 6" seemed pretty straightforward so I wondered what else there was to say about it. There is a little more to it though, like avoiding processed foods (even the vegan ones). Although nothing is absolutely forbidden, he is pretty clear about the foods we would ideally not eat at all and recommends restricting them as much as possible. Bittman also discusses nutrition and why he is promoting veganism for health. A lot of the nutritional information went way over my head because the science is a bit beyond me, and I don't feel like it's necessary. (A lot of people do like that sort of information, but I feel like any diet could somehow manipulate science to prove their point.) Bittman also discusses the concept of dieting in general, and why it's important to think of it more in terms of permanent changes than an extreme but temporary restriction. He encourages just making small changes, at least at first, and getting used to them before continuing. Bittman is very laid back, and acknowledges the difficulties of changing one's diet, as well as the parts of our lives that can making food preparation difficult. He even includes a section with suggestions for people with different eating styles. For instance, the Family Gal (or Guy) already spends time cooking, but is cooking for others in addition to him/herself and must take that into account. The Restaurant Regular is an adventurous foodie. The Grazer eats small portions of food all day rather than sitting down for three big meals. Each of these eating styles comes with suggestions geared towards their particular advantages and challenges. I thought this was a helpful addition. VB6 is rife with the language and self-promotion of diet books. "VB6 is different." "That's why VB6 works." (There's at least one passage in which he acknowledges that what he just said is what everyone says about their diet.) 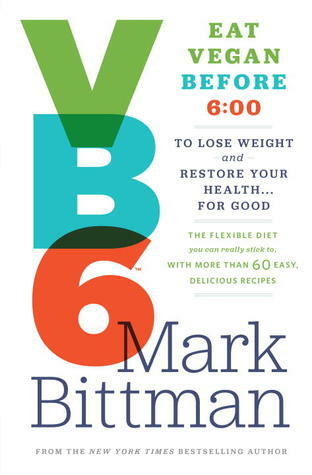 But to give credit where it's due, I do think VB6 is different from and more sensible than most diets, though admittedly I don't spend a lot of time reading about diets. But VB6 more about "diet" as opposed to being "a diet." It's about incrementally making small permanent changes to the way you eat, and in fact it's very much like the gradual changes I implemented in my own diet many years ago, when I became vegetarian and cut way down on junk food and soda. I've been drifting a bit in the other direction and I'm grateful for this reminder about why I changed my diet in the first place. My only criticism, if I had to pick one, is that he gives us a little too much credit for being able to cook easily. For me, and I know I can't be alone in this, there is no such thing as just "throwing together last night's leftovers" or "throwing some vegetables into a pot." There is an hour of chopping, there is trying to fit together weird incongruous leftovers, there is angst. There is barely anything I can cook without a recipe. An omelet is probably it (and that's not vegan.) In writing about frozen meals, Bittman says "in the time it takes to heat one up, you could cook something." What, exactly, can I cook in three minutes? I'd love to know! See, the reason I don't even use a lot of my cookbooks is that most of the recipes seem geared towards impressing guests when you have hours in advance to prepare. But I'm not much of an entertainer. I work all day and then come home and need to have dinner, and not at 9pm. I don't enjoy spending time cooking; for me, it's just a means to getting a home-cooked meal. Bittman offers many helpful tips though, and his recipes are pretty basic. If you're not familiar with Mark Bittman's recipes, some are more like methods than recipes, and all come with variations to make them more interesting and complex. I appreciate this a lot since I'm so cooking challenged. His recipes work for me. In VB6, they are divided by meal: breakfast, lunch, snacks, dinner. (His dinner recipes - which all include at least a bit of meat - don't appeal to me, but many of the others do.) He also includes a section called "Building Blocks" which are core recipes for the types of things you may eat frequently, including methods for cooking big batches of beans, grains, and vegetable stock. I think I was hoping for some easy solutions to my lunch challenges. I take my lunch to work every day but I don't cook every single night of the week thus providing leftovers for the next days' lunch. (Usually I cook one night and eat the leftovers on subsequent evenings.) I need something that will be portable and microwaveable or edible without reheating (I don't have a toaster oven at work.) In desperation I recently checked out a copy of Beating the Lunch Box Blues, which has lovely pictures of fun lunches in colorful containers but they are not very healthy and are incredibly meat-heavy. (Oh, there's a vegetarian chapter, but it's short and repetitive.) I was hoping Mark Bittman would have some easy answers for me, but I think I must conclude that there's just no healthy shortcut for my predicament. Altogether, I found this book helpful and informative, even a bit inspiring. Admittedly, I'm not the audience: it's definitely geared towards people who are moving away from the Standard American Diet of meat, junk food, and soda. I'm coming from the other direction entirely, but still found some helpful recipes many important reminders about why I started cutting out meat and processed foods in the first place. I am a big fan of main dish salads (and of quinoa)! Also, casseroles. My problem with a lot of the blogs and cookbooks that profess to help with lunches is that they're all geared towards kids. Which can be fine - but sometimes can be focused more on being "fun" than healthy and filling.